A specialist in ready-to-wear apparel and home decor, La Redoute relies heavily on email marketing to communicate with its customers. As the second largest seller of women’s clothing and the third largest seller of homewares in France and operating online in 26 countries, email marketing is an indispensable communications resource for strengthening customer loyalty and boosting sales. However as a high-volume sender, the brand faced a number of challenges. It wanted to improve its poorly controlled reputation, whereby sharing its internet protocol (IP) address with other brands, La Redoute France was broadcasting unauthenticated campaigns and therefore could not effectively control its sender reputation, even by monitoring its Sender Score on a regular basis. A poor sender reputation can dramatically hinder a brand’s effort to communicate effectively with its subscribers because internet service providers (ISPs) rely on it to determine their filtering decisions. Reflecting another area of collateral damage associated with IP address sharing, La Redoute France regularly used to receive abnormally high levels of spam complaints. Most of these complaints were not generated by their campaigns, but by other senders’ (i.e., the group’s other brands) using the same IP routing addresses as La Redoute. Complaints generated by those other campaigns had a direct impact on all campaigns, which significantly impacted email marketing performance for La Redoute. High complaint rates can activate higher levels of filtering and ISPs may decide to temporarily or permanently block emails from reaching subscribers’ inboxes as a result. A significant number of inactive contacts meant that, without a clear segmentation strategy, inactive subscribers and spam traps tended to degrade La Redoute’s reputation over the long term and dampen the performance of its email campaigns. ISPs are highly attentive to this and prefer senders whose mailing lists include mainly active users. Senders whose unknown user rate exceeds 5% of their contact base are frequently identified as spammers, and their messages are directed to the spam folder or blocked. La Redoute France contacted experts at Return Path to outline an action plan to improve its performance and optimise its email marketing strategy. Return Path’s Professional Services email experts carried out a deliverability audit, which highlighted email infrastructure issues that negatively affected deliverability and reputation. Several recommendations were then made to optimise La Redoute’s email campaigns. These included the introduction of email authentication. La Redoute France asked its email service provider to set up a dedicated subdomain for its email – a strategy that allowed the brand to focus on the main drivers that influence its reputation and thus the performance of its future email campaigns. The retailer also implemented an IP segmentation strategy. By assigning a separate IP address to each type of campaign, based on the profile of the recipients and the purpose of the campaigns, La Redoute was able to preserve the reputation of its IP addresses, including its main IP address, used for its most active customers. Using separate IP addresses for emails to less active subscribers (subscribers who often do not open emails, do not click on links, delete messages without reading them, or submit complaints) made it possible to work more effectively on a real reengagement strategy. Return Path also advised the retailer to develop a strategy to reactivate dormant subscribers when the audit also highlighted the importance of defining and implementing a strategy to reactivate inactive subscribers. As the quality of mailing lists has a direct impact on reputation and likewise on the deliverability of its email campaigns, this would play a fundamental role in strengthening La Redoute France’s reputation as a good sender. Under the leadership of Marie Loisel, deliverability project manager at La Redoute France, a crossfunctional project team was established for the purpose of implementing Return Path’s recommendations across the board. Loisel commented: “Return Path helped us identify and prioritise our problems, allowing us to deploy a solid action plan and to quickly improve our performance. The expert insights from the audit helped demonstrate the value of Return Path’s Email Intelligence Suite to La Redoute, persuading it that their team needed access to the best performance indicators and the most advanced tools for evaluating and optimising its email marketing on a daily basis. Return Path also assigned a dedicated team to support the brand in its various optimisation projects in order to establish a real trust-based relationship and address each issue real-time. 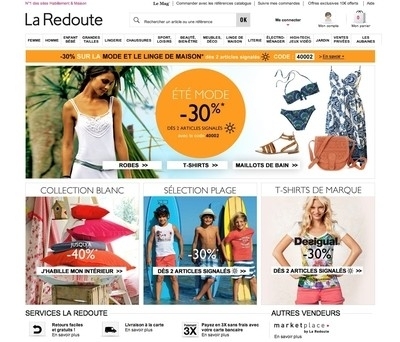 The deliverability audit proved to be crucial for La Redoute. By implementing an effective strategy for segmenting IP addresses, La Redoute France now has control over its reputation and can optimise its inbox placement rate on a daily basis. The extremely low complaint rates that the brand now enjoys are reflected in its exceptionally good sender reputation metrics. In terms of reactivating inactive subscribers, La Redoute France used data insights from Return Path’s Inbox Monitor to refine its strategy. Segments that posed a problem could then be easily identified and isolated to avoid negatively impacting future campaigns. After implementing the recommendations formulated as part of the deliverability audit, La Redoute was soon able to measure a dramatic increase in its inbox placement rate – from 71% to 96% in less than six months. Repeatedly implementing best practices and abiding by prerequisites and other standards set by Return Path also enabled La Redoute France to earn Return Path Certification after only a few months, joining the largest network of trusted senders in the world. Through this certification programme, La Redoute now enjoys preferential delivery at key global ISPs and other filtering companies, along with an optimised inbox placement rate. Since implementing the Return Path Certification programme, La Redoute France has been able to maintain consistently high email delivery rates, with slightly less than 2% of its emails being sent to the Spam folder. La Redoute now optimises its email marketing strategy on a daily basis, using unique insights, analysis and data supplied by Return Path’s email intelligence solutions. Thanks to the privileged relationship established with members of the Return Path team, La Redoute France now has efficient, impactful, and highly effective email practices that are so beneficial that the company is considering expanding its projects to build mobile campaigns that are optimised according to its subscribers’ devices.